Upon arrival on the station, we immediately started work on “relief” – a period of about a week where the base works 24 hours a day to unload the ship and haul the cargo to the base. I was on 12-hour “night” shifts – the “night” part being a useless description due to the same number of people being awake as during the “day” and the 24-hour sunlight. 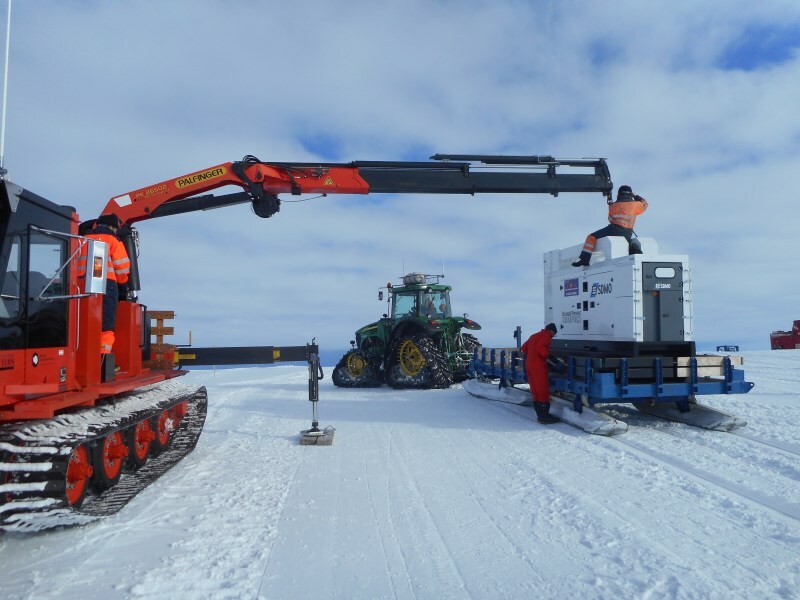 I was on the team at Halley unloading all the cargo from the transport sledges, pulled by large John Deere snow tractors up from the coast where the ship was being unloaded. 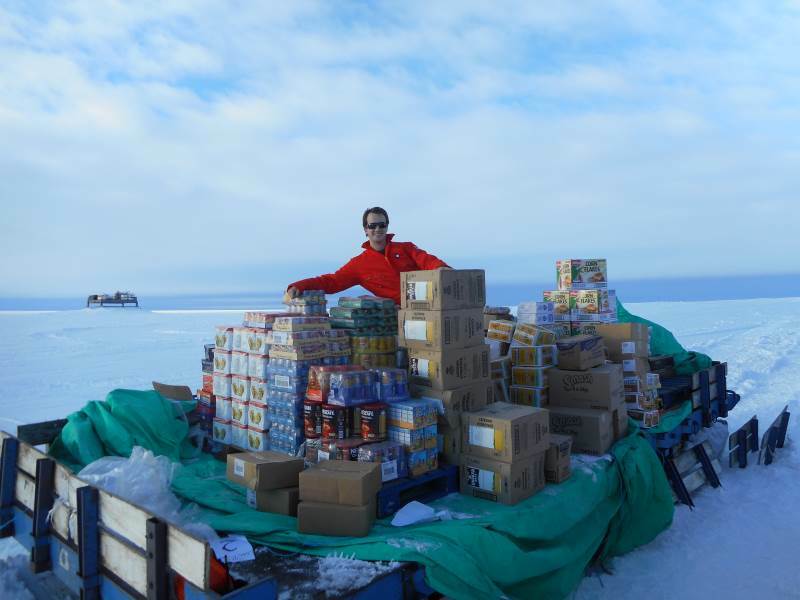 Luckily, that first night shift the cargo hadn’t started moving in force so we didn’t have to unload too much that first night – I had time to explore my new home a little and get to grips with this alien landscape that will surround me for the next 14 months. I also noted, while passing boxes from person to person, that the people in charge of our food supply feel we need more rhubarb in our diets. A lot more. The last part was the most time consuming: the fuel. We unloaded 1738 barrels of fuel in about 48 hours. They arrived from the coast of sledge trains of 72 barrels at a time. 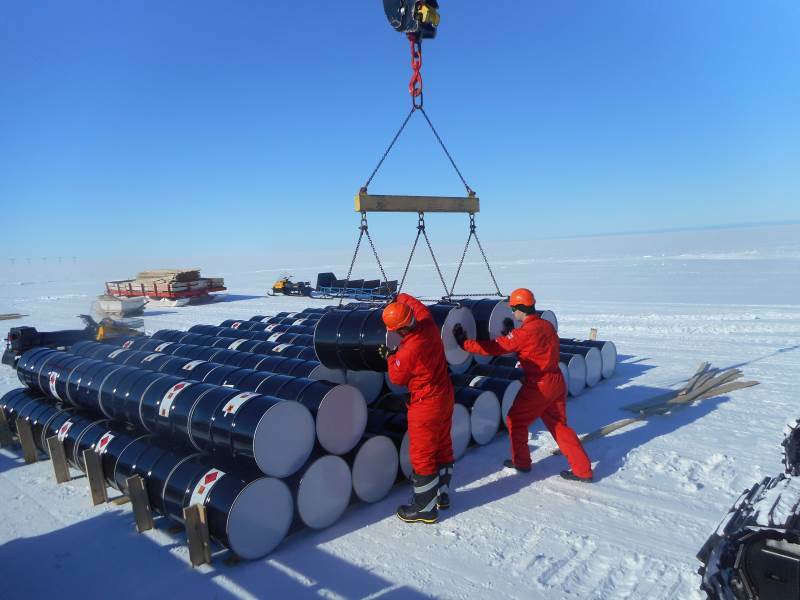 We had to lift these off the sledges and into fuel “dumps” – a pile of 198 barrels each. This will be the major source of fuel for our base, vehicles and aircraft for the next year. When moving them, we had help from a JCB digger and so we only had to manhandle them a bit. Just as well – they each weigh 220kg, and we move three at a time…. All this was pretty exhausting. I slept well. Well, mostly. The first night we had two fire alarms. I was in a groggy state of disorientation when I arrived at the muster point in my PJs but it seemed the day shift had things under control – the fire team were suited up and people were being counted. Three days in, we had new year. Since we were on nights, this happened right before lunch, just after we came back from unloading barrels. The day shift had stayed up late and we all sat and ate chocolate cake – the reason being another of the winter team, David, had made a bet with his sister the year prior not to eat any chocolate for 12 months. At midnight, that expired and he made up for that years’ chocolate deprivation with gusto! 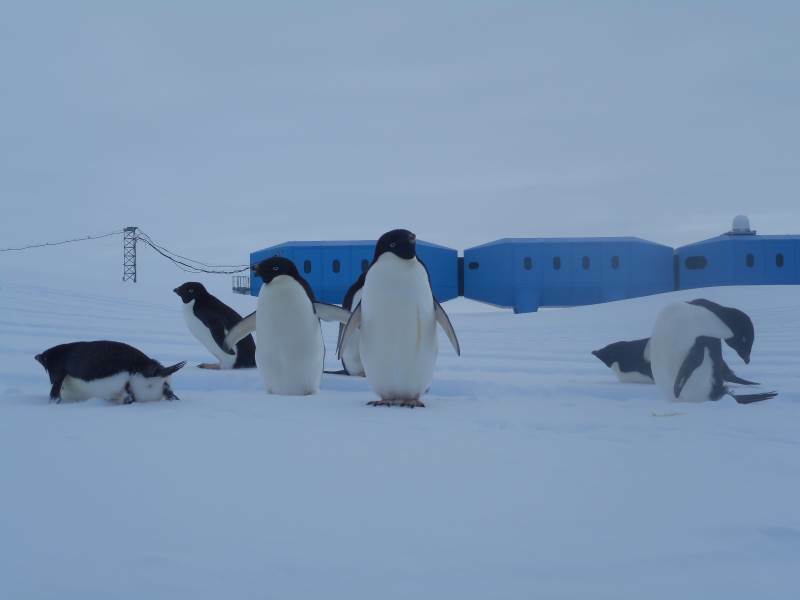 The real treat for me, though, was later that afternoon, when, while coming back from a barrel unloading, we saw a bunch of penguins waddling near the base. They had wandered up from the coast following a series of drums we use to mark the path to the base. We walked as close as we were allowed to but, as penguins have no fear, they approached us further – perhaps coming to 2m away. Their curiosity satisfied, they all started falling asleep, right in front of us, until they were all snoozing. The big one in the middle made an effort to stay awake (maybe to keep watch?) but ultimately nodded off too.